Lady Victoria Colliery, built in the mid-1890s. Its very large surface arrangements reflect a big change in British coal mining, during which mines were sunk deeper, and required much bigger engines and a much larger scale of operation. 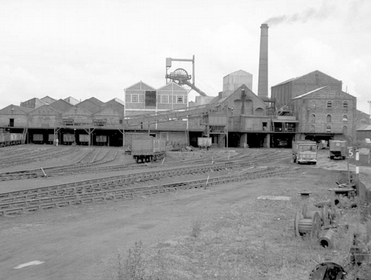 This photograph of the colliery was taken by Professor J R Hume in 1969, 12 years before its closure. It shows the extensive railway sidings, which linked the colliery to its main markets in Edinburgh, and to the tweed mills to the south in the Scottish Border towns such as Hawick, Selkirk and Galashiels. There were several railway lines running beneath the colliery. Coal was brought up the shaft by a huge steam-powered winding engine, and then inspected and sorted on coal 'picking tables', before being emptied into railway wagons below. Also visible in the picture is a large building on the right side. This was the place where coal was washed in a preparation process which separated it from waste material such as rock and other debris. Coal dust was also retrieved and used to power the colliery's boilers, generating steam to drive the winding engine, and to heat many of the buildings. The boiler-house chimney can be seen smoking in the background.